Becoming a member of the Wisconsin Chapter of The Wildlife Society has many benefits to offer both wildlife professionals and students interested in pursuing careers in the wildlife field. Please click here to download the WCTWS brochure. A forum for interaction and communication among researchers, managers, educators, students, and others interested in Wisconsin’s wildlife. An opportunity to bring science to wildlife policy decisions. A source of information on research findings, management issues, legislative activity, and professional news. An opportunity for professional growth of members through annual conferences and trainings. 1) Print, fill-out, and mail the WCTWS Membership Application along with your check to the address provided. 2) Join and pay via the Google Form and PayPal button below. 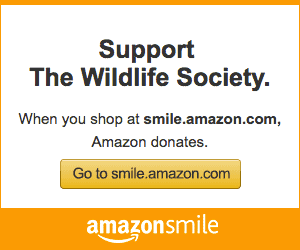 3) Go to The Wildlife Society’s website and join the WCTWS on-line. You can add a state chapter membership at the same time you join or renew your TWS, section, and/or working group memberships. Click here to join The WCTWS online! If submitting payment via PayPal please also complete the Google form above.